1. “Look at THA-YAT!” in a girly-pitched, southern drawl, coupled with an ear-to-ear grin when an item is particularly intriguing to him. 2. “Cheeks, cheeks, cheeks!” while grabbing my face and patting them with such unconditional love it could melt any heart. Followed by a big ol’ kiss. 3. “No, no, no (friend/boy/girl). Don’t take my (insert object here, including “mommy”). Yah, he’s not much into sharing these days. 5. Wishing all he loves a happy birthday. Daily. Hey – every day is a reason to celebrate, right?! 6. “I’m scarruhd!” complete with a run toward your shins as he reacts to large noises. Generally followed with “Mommy take me safe” or “Daddy take care of you” as we live to prove we’ll protect him. 8. “biCYCLE!! !” at any single one that passes – he can spot a motorcycle miles away, tucked in a forest. His Hot Wheels collection is up to six. 9. <”Insert person’s name has a boo boo – doctor make all BETTER!” – his recent run-ins with Grandpa in the hospital, his pup getting stitches and suffering a few cuts and scrapes from the ocean. 10. “Lollipop!” after each time he does anything well or follows an instruction. Complete with a cocked head and anticipating eyes – you’d think he was a puppy. This was our fault in creating a monster on two 14-hour travel days. 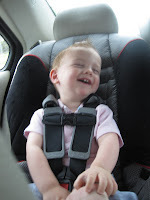 Sometimes, I wonder if I ever even experienced such joy, such humor and amazement before he came along. Here’s to a growing vocabulary, hilarious sayings and laughing out loud for a lifetime together. I love you little buddy. PS: Bonus sayings I caught this morning: a) "Coffee's ready! Chicken nuggets ready!" and "warm it up!" all related to our microwave cooking b) "It's RAINING! It's cloudy or it's sunny" as if he's the weatherman himself c) "LET'S GO!" followed by the insistent tugging on my hand and a big ol' smile when he's ready to pack on an adventure. Sigh - so much love. So much laughter.